Short Animation on Text Neck: [[[[[[Video]]]]]] Frequent gamers, texters and computer users can develop a condition known as ‘Text Neck’. The condition is a result of bad posture adopted when gaming and texting. Telltale signs include the head tilted forward, shoulders curved, arms bent down by the side, and a hunched back. This animation illustrates what ‘Text Neck’ is, its symptoms and how to avoid them. 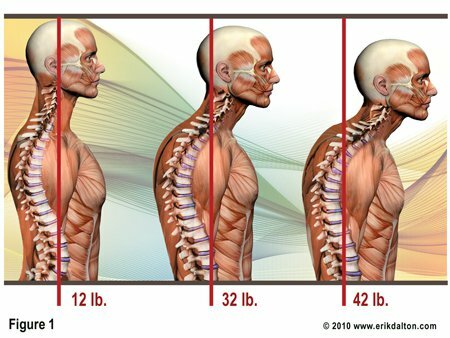 Why is Forward Head Posture so stubborn? As a developing postural deviation, Forward Head Posture is mainly caused by subconscious responses of our body to unsupportive environmental conditions in everyday life. From long hours spent at computer, to poorly designed office furniture, to the slouching tendency of our own body while sitting, the unsupportive environmental conditions are pervasive in our lives. Of course, education and awareness of Forward Head Posture and its severe consequences is important; education and awareness of health hazards of sedentary lifestyles is also important, including the choice of the right office furniture and work station. However if the tendency of subconscious negative reactions is not controlled, none of the previous efforts will lead to our desired objective of correcting or preventing Forward Head Posture or sometimes called “Anterior Head Carriage”. It is the subconscious response that is the most difficult to control. And it is the subconscious response that makes the Forward Head Posture so stubborn. Furthermore, a forward postured head adds 15 – 30 lb of additional tension/stress on its supporting muscles in the back of the neck for each inch of forward protrusion of the head. The additional stress will, with time, leads to further protrusion of head – more severe Forward Head Posture and related complications. As a result, unfortunately, FHP not only is stubborn, but also will progress from bad to worse, if not being attended. How to get the subconscious response under control? The key word is proprioception. In the early 1900’s, English neurophysiologist Charles Sherrington (1857-1952) first established his landmark research on the function of the neuron and study of reflex action, for which he received the Nobel Prize for Physiology or Medicine in 1932. It was Charles Sherrington who first used the concept and the term of “proprioception”. When stimulation’s are provided to the neurons, human body will be activated to subconsciously coordinate and balance itself. By providing the right stimulation to the right neurons, human body will subconsciously respond in a way that counters the responses that are otherwise caused by unsupportive environmental conditions leading to Forward Head Posture. Through postural awareness, better ergonomics, and corrective spinal exercises (chin retraction, shoulder blade/mid-scapular strengthening, and a stronger core) you can correct the devastating effects of Forward Head Posture. If you are on facebook here is a link to ergonomic workstations and chairs.